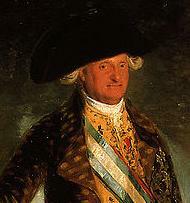 Miguel de la Grúa Talamanca, the Marqués de Branciforte, the fifty-second Viceroy of Neuva España, has two claims to fame as a ruler. His first was as the most corrupt chief-administrator this country has ever had (and that takes some doing). His second was commissioning one of the greatest pieces of sculpture ever produced. Alas, his greatest contribution to the culture appears to have been irretrievably damaged by those working in the spirit of his greatest vice. 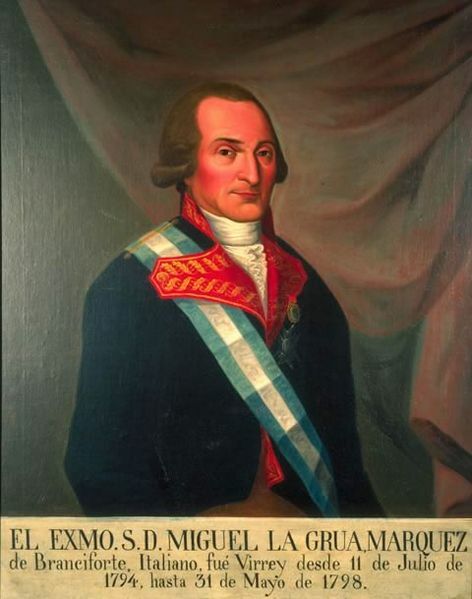 If the Marqués had spent his life back in his hometown of Palermo, Sicily and probably being a founding father of the Mafia, but with the Kingdom of Sicily basically a subsidiary of Spain, there were much more opportunities abroad for a young, ambitious crook than merely extorting the local peasantry. Especially after he married the sister of the equally ambitious and amoral Manuel Godoy. The handsome Godoy, not fancying a career as an obscure army officer, was quite willing to … um… offer his services to the homely, and rather frustrated, Queen Maria Luisa. 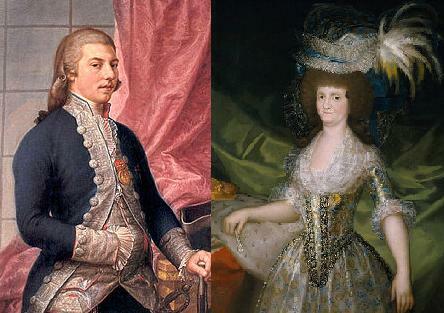 Queen Maria Luisa was saddled with a marriage to the son of one of the most intelligent and hard-working European monarchs in history, Carlos III of Spain. Alas, Carlos IV was one of the stupiest, and laziest of European rulers. He was happy enough to let Maria Luisa make the decisions and run the country. Maria Luisa was happy to let Manuel Godoy take over the work for her… and Manuel — having some sense of family values — happily obliged his brother-in-law Miguel de la Grúa’s wish for unlimited opportunities to steal. Arriving in Veracruz in 1794, Manuel spent a happy two years skimming the tax receipts, brow-beating the campesinos, and cheating the Indians. He just took a cut (whether legal or not) of any real estate transaction anywhere within the realm (which at the time included everything from what is now the Panamanian Border to the headwaters of the Missouri… Spain having acquired what was French Louisiana in 1762). Miguel, at one point, simply had a Veracruz brothel seized… mostly because he wanted ahem… some company for the evening… and he took a fancy to some of the furniture (which he later sold). While his depredations of the lower classes might have been overlooked, he managed to basically, annoy even the rich Mexicans enough to the point where some began openly considering a radical departure from the mother country. But, before things reached such a point, some pesky honest bureaucrats had to stick their noses in… going so far as to complain to Madrid. Somehow word got through the Godoy-Maria Luisa filter and reached the ear of Carlos IV… who had a dim idea that the colonies should be sending back more money than they were… and wanted to know what the problem was. Thinking fast, Miguel had a doozy of a rationale. 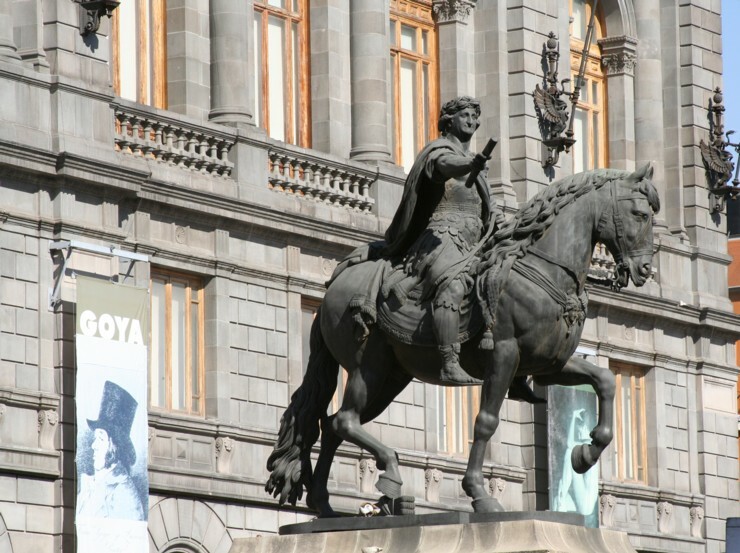 It wasn’t that the money wasn’t being used, but that the monument being erected to the glorious Carlos IV by his grateful subjects in New Spain, destined to stand for all time in the at the center of Mexico City, was … well… rather pricey. Which Carlos bought. It is true that some major public works had been undertaken, especially in Mexico City, but those were buildings, not statues. While the skill sets might have existed for Aztec style monumental art, no one in the Americas had ever produced a major sculptural work, although Mexico City’s sewer and drainage inspector, Manuel de Tolsá had been been to art school… and had studied sculpture back in Spain. Viceroy Manuel, maybe carried away with his own fantasy, envisioned a marble statue, but Tolsá… who after all, did have to think about what was UNDER the city, realized it would be much too heavy. He proposed a “lost wax” bronze monument (which is hollow inside) … something he’d never tried before, but at least something a bit lighter than what he estimated as about 100 tons of stone (not to mention the problem of finding a suitable chunk of marble, transporting it and carving it). As it was, Tolsá’s design was, in some ways, a pastiche. Needing to find something heroic for Carlos to be doing, he is shown dressed as a Roman emperor, bearing… not a sword… but SOMETHING. That could be put off til later — it was something of a gamble, but there had to be something that Carlos could be credit with doing that, at a stretch, could be said to justify his grand monument. Based on heroic Imperial Roman statutary, Carlos’ goofy-looking and pudgy head would be attached to a “classical” body (from Tolsá’s own collection of copies of famous sculptures), mounted on a the only live model, and only “real” Mexican in the composition, Tambor, the horse. While the statue may have been an absurd idea, it did fire Tolsá’s imagination… and his plans for the monumental bronze (at 5 meters long and 4.85 meters high, weighing in at just under 20 tons, it is one of the largest monumental bronzes ever completed, and the first in the Americas) was ambitious enough. 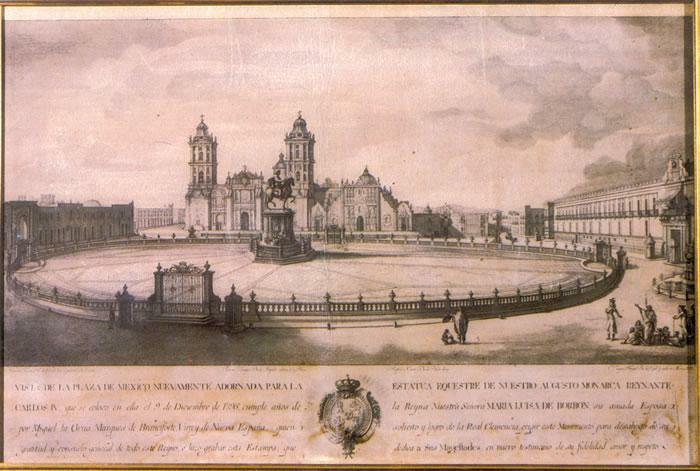 But word of his commission led to other commissions, and Tolsá’s work as an architect (designing among many others, Mexico City’s Palacio de Minería, and Museo de San Carlos, as well as the Hospicio Cabañasin Guadalaja ) would delay the project for several years. The crooked Viceroy, meanwhile… having stolen about all he could… returned to Spain in 1796. However, before he went, he proudly unveiled on the square in front of the viceregal palace (today’s National Palace) NOT the statute, but a wooden and stucco model of the statue on a marble base. The technical term for a statue’s base in Spanish is “zocalo”… which not too many people would have heard of before… but took the fancy of the public to such an extent Mexicans began applying the word to similar municipal squares everywhere. With his other commissions, Tolsá’s masterwork would not be unveiled until 1803 … by which point, he’d found something worthwhile to put in Carlos’ hand that was at least heroic: his 1802 edict order smallpox vaccination being sent to the colonies. I don’t know, maybe it makes sense that the crooked viceroy ended up commissioning a sewer inspector to build a monument to public health, but I don’t think that was the intention. 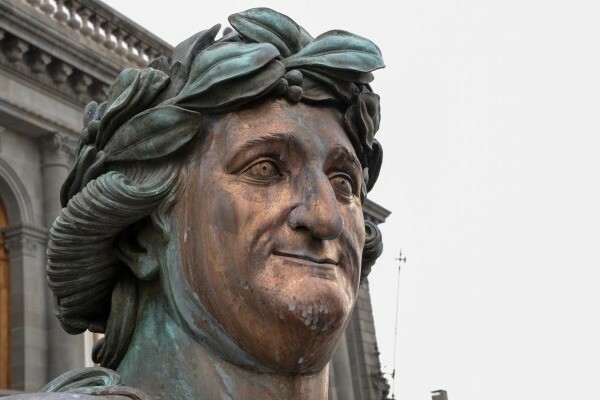 Anyway, Alexander Humbold was dutifully impressed, considering it the second greatest sculpture in the world (he liked one of Marcus Aurelius he’d seen in Rome a little better). The Mexican people… while they remembered the Zocalo… were of mixed feelings. While everyone admired Tambor the Horse, nobody particuarly liked Carlos IV, and few tears were shed when he was forced to abdicate in 1808. To protect the work, Carlos had to be covered up during the Independence wars of 1810-20, after which there was some suggestion of knocking the head off and replacing it with Augustín Itubide, which went nowhere (mostly because Tolsá had died in 1808 and no one wanted to take on the job… and Iturbide’s short-lived Empire of Mexico had other priorities, like dealing with an empty national treasury. That empty treasury led the first president of the Republic, Guadalupe Victoria, to consider having it melted down for coinage, but he was talked out of it by pro-Spanish historian and cultural guru, Lucas Alemán. However, Alemán did understand that not everyone wanted to be reminded of Carlos IV (as pro-Spanish as he was, even Alemán was at most a lukewarm defender of his reign), and the 20 ton statue was moved a few blocks away to what is now the courtyard of the National Prepatoria. In 1852, it was hauled up the road to what is now the corner of Reforma and Bucarelli… serving as the first of the Reforma monuments that line the avenue. In 1979, being somewhat overwhelmed architonically by the large new buildings in what had become an important commercial center, the Caballito was again moved (and replaced by a Alexander Calder Sebastian abstract horse… that — perhaps in honor of Tolsà’s day job with the city — doubles as a sewage gas escape pipe) to its present location… now named “Plaza Tolsá”, site of the National Museum of Art. With the exception of the honest Guadalupe Victoria, El Caballito de Tolsá has always been treated with respect by Mexican leaders, even the outright crooks who almost measured up in venality to Miguel de la Grúa Talamanca. Santa Anna, Huerta, Carlos Salinas… they had nothing but respect for Tambor the horse and his goofy looking rider. But… this is the age of neo-liberalism, and where crooked viceroys and venal caudillos feared to tread. Having starved the Instituto Nacional de Antropología e Historia, which oversees the nation’s substantial cultural treasures, and having put it under the “guidance” of political hacks (much as Ronald Reagan put the U.S. National Endowment for the Arts and Humanities under similar control), important preservation work has been “privatized” and major cultural sites have been seen as opportunities for short-term profit (one thinks of the Elton John concert at Chichen Itza… which had to be ritually cleansed by the Mayans after its pollution by the trash-bearing crowd… or the probably permanent damage caused to the same site by installing fixtures for a “sound and light show”). Although not in any major danger, El Cabilitto de Tolsá has been sitting outdoors for the last two centuries, and bronze does discolor. What should have been a simple job for the professionals at INAH was let out to a private firm, which used nitric acid in a much too strong concentration (and overcharged for the job, it seems), causing damage to about a third of the entire work, horribly discoloring it (the gray patina was never considered particularly ugly, although it would have been a site to see it new and shiny again) and… this being a venal and ugly age… an untold financial loss. Manuel Tolsá, Obra escultórica, UNAM: Faculdad de Ingeniería, División de Educación Continua y a Distancia. Richard, what did you expect? This is as Mexican as you get. And it has nothing to do with privatization. The cleaners did exactly what all Mexicans do when cleaning. They soaked it in Clorox and lemon pledge. That’s my theory anyway. I once came across a very old postcard in a street market in Mexico City, of that statue when it was situated on Reforma…. More like heavy doses of nitric acid… with no testing. Not by Calder (sadly) but by Sebastian. You’re right… I should know better to write in the middle of the night, and post without fact checking the small things. I KNOW authors can’t edit themselves, but with a project like this, not much alternative to letting you find the errors. Many thanks.